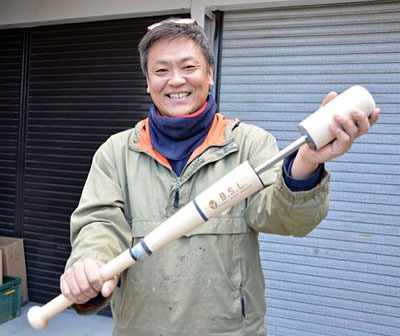 IDE, Kyoto Prefecture--When Tatsuya Noda's son was learning to play baseball when he was a boy, the father used scrap wood from construction sites to fashion practice bats for his budding slugger. Noda is now 45 and his son is about grown up. The former construction company employee has found a new calling manufacturing practice bats from broken baseball bats and other materials. Noda has been so successful that even professional baseball players use his practice bats to groove their swings. After repeated trial and error, in 2006 he produced his first Practice Swing Bat. Noda runs a metal pipe through the middle of the bat, from the grip to the end, and inserts two cylindrical weights into the pipe. If there is a problem with the player's swing, the weights slide up separately and bang against the end of the bat, emitting two separate sounds. According to Noda, when a player uses his body's rotation to apply centrifugal force on the grip and slightly bend the bat, the weights move at the same time and emit only one sound in mid-swing. "You can use it to check your batting form," Noda said. The materials come from broken, unusable bats Noda gets from university and adult amateur teams. He fashions the leftover parts into grips, weights and other parts, connects them with pipes, then carves the surface to give the bats a smooth finish. Noda makes them one at a time, at a workshop near his home. He has had more than 100 professional and high school players use his bats to correct their swings. The bats have earned positive reviews through word of mouth among users, and Noda began getting orders two or three years ago. In 2010 he left the construction company and started focusing solely on making bats. Nowadays, when he is busy, he gets about 50 orders a month. Users include professional and top amateur players, and even players outside Japan. Last season, Yosuke Hiraishi, the batting coach for the Japan Series champion Rakuten Eagles, reportedly used the bats to instruct his players. At last year's baseball draft, catcher Seiji Kobayashi of the Nippon Life Insurance team, who was the No. 1 pick of the Yomiuri Giants, reportedly used a Practice Swing Bat when he played at Doshisha University. The Austrian national team said it will begin using them, too. "It came from my ardent wish for my son to feel the joy of hitting a home run," Noda said of his development of the Practice Swing Bat. "I want to help, if only a little, kids who say they want to become pros or play baseball at a championship-caliber school get closer to their dreams." Noda's Practice Swing Bat costs 15,000 yen ($148). Inquiries can be made to Noda (maru1kohei@gmail.com).